The high level of technology nowadays and the huge bundles of cables that result give a high potential risk of fire. The materials for coating electrical cables most frequently used are generally flammable and therefore increase the fire load. Due to the considerable development of smoke, rooms and escape routes become a risk and extinguishing is hindered. The smoke contains toxic elements that endanger health. When cables containing halogens burn, e.g. PVC cables, larger quantities of HCl gases are released (approx. 250g HCl/1kg PVC) which can be fatal in larger levels. The actual building also suffers because HCl gases attack the concrete reinforcement. It is generally known that the extensive damages for people, the environment and properties are not produced by the actual fire but by the aggressive fire gases. 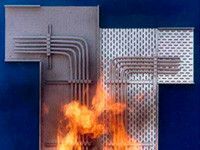 In the event of a fire, cables work like ignition wires that transfer the localised fire to other parts of the building. This creates a so-called flashover is cable shafts due to radiation heat which leads to uncontrolled damages. In contrast, Hapuflam® cp forms an insulating layer. Under the influence of heat, an insulating foam layer up to 60 times the original coating thickness is produced. In this process, alkali reactive, organic nitrogen compounds are released which bind the aggressive HCl gases. Automatic extinguishing of short-circuit blazes is actively promoted. The burn-off speed is reduced to a minimum and the ignition wire effect is lessened. Hapuflam® cp is applied by spraying or applied with a brush along the profile. The cable systems and cable bundles, the visible surfaces are to be coated. The bearing construction is protected as well. Hapuflam® cp does not lead to an increase of the cable operating temperature and the electricity resistance is not reduced. The processing conditions of Hapuflam® cp are so favourable that processing above head is even possible. The lower layer thickness achieves weight savings in comparison to other measures. Hapuflam® cp can be used subsequently in existing building complexes´.